DNA methyltransferase 1 (DNMT1) expression is lower in M2 than in M1 adipose tissue macrophages (ATMs) and is upregulated in isolated ATMs from ob/ob mice. 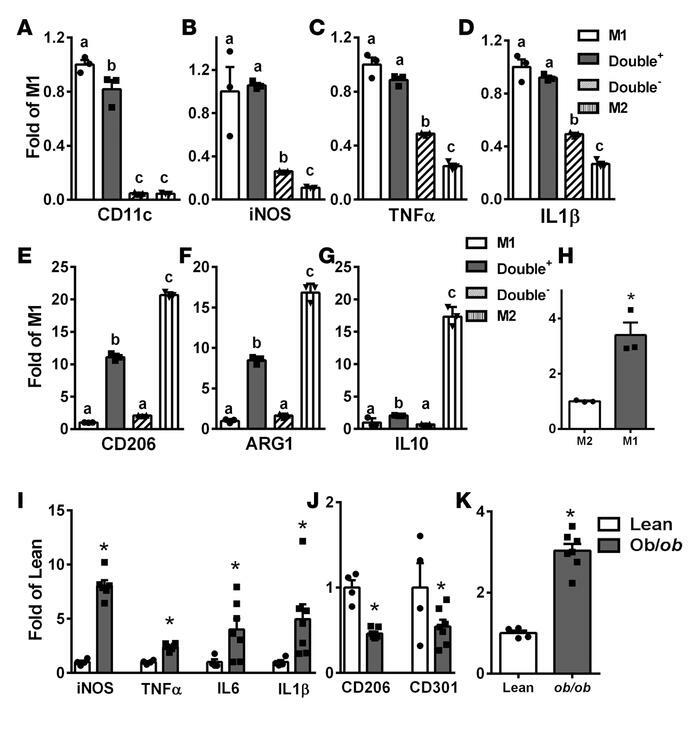 (A–G) Expression of M1 and M2 markers, including CD11c (A), iNOS (B), TNF-α (C), IL-1β (D), CD206 (E), ARG1 (F), and IL-10 (G), in M1, M2, double+ and double– ATMs isolated from adipose tissue of 8- to 10-week-old male C57BL/6J mice. Cells from 3 to 4 mice were pooled for RNA isolation and gene expression measurements. M1, F4/80+CD11c+CD206–; M2, F4/80+CD11c–CD206+; double+, F4/80+CD11c+CD206+; double–, F4/80+CD11c–CD206–. (H) DNMT1 expression in M1 and M2 ATMs. (I–K) M1 (I) and M2 (J) markers and DNMT1 (K) expression in ATMs isolated from 14-week-old lean and ob/ob mice. Cells from 3 to 4 lean mice were pooled, whereas cells from individual ob/ob mice were used for RNA isolation and gene expression measurements. Data are expressed as the mean ± SEM. n = 3–7. Groups labeled with different letters are statistically different from each other. *P < 0.05. Differences between groups were analyzed for statistical significance by Student’s t test or ANOVA with Fischer’s probable least-squares difference post hoc test.